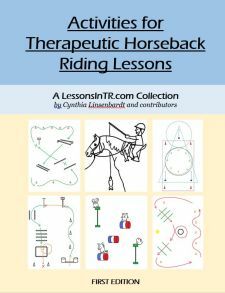 So far I have given notes on the physical and cognitive challenges of severely disabled riders, and the adaptations and support you can use to help teach them how to ride. Now we will discuss the actual riding skills to teach them, and activities that incorporate these skills to motivate riders and keep them engaged. Note some of this has already been touched on in the past parts of this series, but these are more ideas! While our hope is that any rider can work their way through all the riding skills, many severely disabled riders will be working on the basics for a long time. This is a list of the most common basic skills, corresponding aids, and potential adaptations I’ve used and seen others use with these riders. Be true to the original aids, but adapt the aids in whatever way is best for the rider. The point is communication. 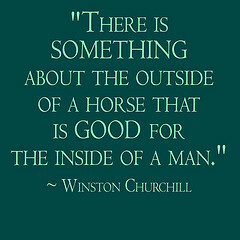 Riding skills and aids are about the rider attempting to communicate with the horse. Support the attempts. If the rider attempts to communicate with the horse, use the team to support their communication so the horse understands. Continue to use sidewalkers to help with the original aids as much as possible (for example, leg aids for walk on), because this can create muscle memory, so one day the rider may be able to have a break through and do it themselves. Use your best judgment whether to use one aid or multiple aids. Some riders may benefit from a few aids at once to gain muscle memory, others may need to focus on one and once they get it add another, and so on. Start with the aids that are the easiest for them to do and understand, then add on from there. This is not technically a riding skill or aid, but since it helps with all riding skills, I’m including it. Use sidewalkers to manipulate posture to teach them correct balance. Work on maintaining midline for 10 seconds, 1 wall, a whole lesson without readjusting, etc. Dedicate specific times during the lesson to work on posture and attempting to let them balance for longer on their own. Use Activities that incorporate skills to keep them engaged, or they may tune out. Just skills can be unmotivating or beyond their focus. For example, instead of halt/walk at letters around the arena (uninteresting, hard to find off to the side and small, hard to connect letter to stopping), halt at the ball and play with it then walk on to the next activity (ball is motivating, a common object, and a visual you could put in front of them). One of the keys to creating successful activities is to build on the skills the client already possesses and incorporate sensory stimulation that makes the activity fun and inviting. Touch further up mane, further, further! Brushes, groom the horse from its back – practice reaching, order, etc.